Norwegian Cruise Line today reported results for the quarter ended March 31, 2014. The company also announced that its Board of Directors today has authorized a three-year, $500 million share repurchase program. “Our strong results in the quarter include an almost four-fold increase in earnings on an adjusted basis,” said Kevin Sheehan, President and Chief Executive Officer of Norwegian Cruise Line. “With both Breakaway class ships now in our fleet, it is easy to appreciate the impact of their impressive earnings power, which includes commanding double-digit premiums over other Norwegian ships in the same itinerary,” continued Sheehan. For the first quarter of 2014, the Company reported an increase in Adjusted EPS to $0.23 on Adjusted Net Income of $49.6 million compared to $0.06 and $12.9 million, respectively for the same period in 2013. On a GAAP basis, diluted earnings per share and net income were $0.24 and $51.3 million, respectively. Net Revenue in the period increased 27.8 percent to $499.3 million, driven by a 23.2 percent increase in Capacity Days and a 3.8 percent improvement in Net Yield. The increase in Capacity Days was primarily from the addition of Norwegian Breakaway and Norwegian Getaway to the fleet in May 2013 and January 2014, respectively. The Net Yield improvement of 3.8 percent, or 3.9 percent on a Constant Currency basis, was a result of higher passenger ticket and onboard and other revenue. Revenue for the period increased to $664.0 million from $527.6 million in 2013. Adjusted Net Cruise Cost excluding Fuel per Capacity Day increased 3.7 percent (3.4 percent on a Constant Currency basis) mainly due to inaugural and launch-related costs for Norwegian Getaway along with incremental expenses for the planned dry-dock of Norwegian Spirit. The Company’s fuel price per metric ton, net of hedges, was $643 compared to $673 in 2013. Fuel consumption per Capacity Day in the quarter decreased 6.8 percent which excludes an additional benefit of 0.7 percent from dockside charters for vessels used as floating hotels. Interest expense, net for the quarter was $31.2 million compared to $127.7 million in 2013. Interest expense, net in 2013 included $90.5 million in charges related to the prepayment of certain credit facilities and the redemption of certain of the Company’s senior notes with proceeds from both the Company’s initial public offering and other transactions. Excluding these charges, Adjusted Interest Expense, net was $37.2 million in 2013. The year-over-year reduction in interest expense is due to lower interest rates in the period resulting from the Company’s capital structure optimization initiatives carried out in 2013 which more than offset the impact from higher debt balances related to the financing for Norwegian Breakaway and Getaway. The Company recorded an income tax benefit of $9.4 million compared to an expense of $2.2 million in the prior year. The income tax benefit in 2014 is primarily related to the election of an alternative, acceptable tax methodology in connection with the change in the Company’s corporate entity structure completed in 2013. This election resulted in a $6.7 million non-recurring benefit which has been excluded from Adjusted Net Income and Adjusted EPS. The Company announced today the authorization by its Board of Directors of a three-year, $500 million share repurchase program. The Company may repurchase its ordinary shares from time to time, in amounts, at prices and at such times as it deems appropriate, subject to market conditions and other considerations. Norwegian may make repurchases in the open market, in privately negotiated transactions, in accelerated repurchase programs or in structured share repurchase programs, and any repurchases may be made pursuant to Rule 10b5-1 plans. The program will be conducted in compliance with applicable legal requirements and will be subject to market conditions and other factors. “Our focus at Norwegian is to drive shareholder value by strengthening our product proposition, honing our strategy of driving demand and increasing returns through our disciplined newbuild and fleet enhancement programs. This share repurchase program complements these initiatives by allowing us to be flexible and opportunistic to repurchase shares at attractive levels,” said Sheehan. The program does not obligate Norwegian to acquire any particular amount of ordinary shares and the program may be modified or suspended at any time at Norwegian's discretion. As of March 31, 2014 the Company had approximately 205 million ordinary shares outstanding. The Company carried out two successful dockside charters which showcased the brand, provided valuable exposure and introduced new potential guests to Norwegian’s product offering. In January, Norwegian Getaway played host to the Bud Light Hotel during Super Bowl 48 in New York. The event received over one billion impressions and was one of the hubs of activity during the festivities leading up to the game. The Company made several announcements in the quarter regarding its latest newbuild, Norwegian Escape, which is currently under construction at the Meyer Werft shipyard in Germany for delivery in the fall of 2015. On March 20, the first steel was cut at the yard, marking the ceremonial beginning of construction of the 4,200 berth ship. The Company also unveiled renderings for the ship’s varied accommodations, including the latest rendition of the Company’s signature ship-within-a-ship complex, The Haven by Norwegian. The artist and design for the Norwegian Escape’s hull art was also announced during the quarter. The Company has commissioned famed marine wildlife artist and conservationist Guy Harvey to create a signature work that, at 1,065 feet, will be his largest piece to date. The design, which runs from the bow to stern, features scenes of undersea and aerial wildlife. The Company also announced support for the Guy Harvey Ocean Foundation, an organization which funds marine-related scientific research and educational programs. 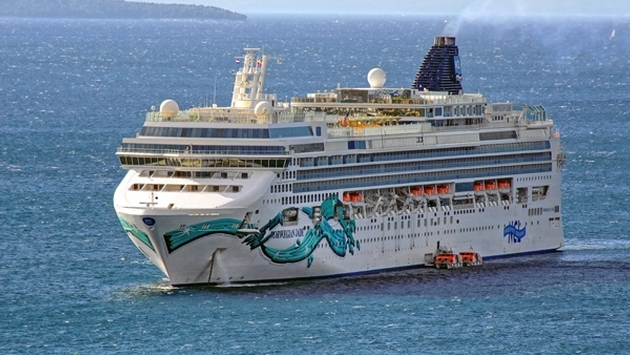 Regarding deployment, the Company announced that for the 2015/2016 season, Norwegian Epic, currently the Company’s largest ship, will trade her seasonal winter Caribbean itinerary for a year-round deployment out of Barcelona, further demonstrating the Company’s commitment to the European market. Following Norwegian Epic’s exit from the Caribbean, Norwegian Escape will arrive to Miami in November 2015, offering seven-day Eastern Caribbean itineraries. Norwegian Getaway will continue her year-round deployment from Miami, sailing seven-day Western Caribbean itineraries. Other highlights from the Company’s winter 2015/2016 deployment announcement include a return to sailings in South America on Norwegian Sun and the deployment of Norwegian Jewel to sail seasonal Mexican Riviera voyages from Los Angeles. The Company also announced plans for the installation of exhaust gas scrubbers on six additional ships to reduce fuel emissions along with the Company’s overall carbon footprint. This order is in addition to scrubbers that are almost complete on Pride of America and contracted for installation on the upcoming Norwegian Escape and Bliss. Installation of the scrubbers on the six ships will take place beginning this spring and continuing through 2016.